I was browsing Chapters a little while ago and I came across some fun printed masks, so of course I had to pick one up and try it out! 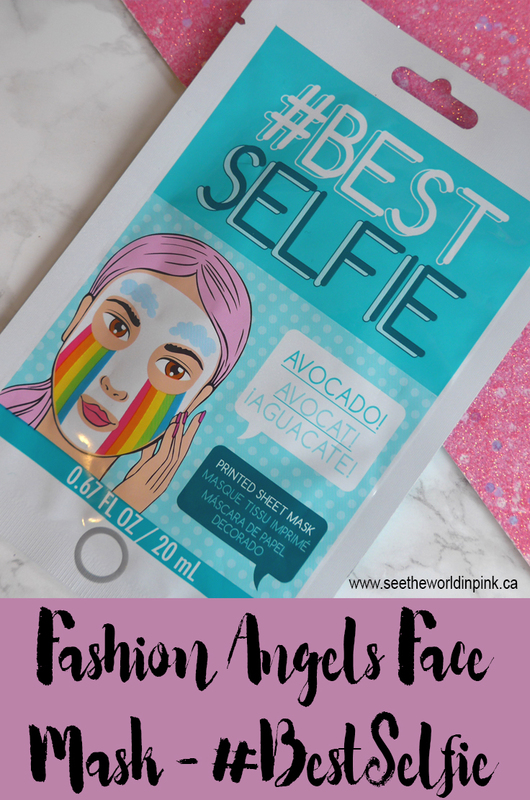 Fashion Angels Face Mask #BestSelfie ~ $6.95 CAN. This printed sheet mask is not only fun to apply it's also great for your skin! The rainbow print will make you smile while nourishing your face with Avocado. Don't forget to take a Selfie! I've never seen or heard of this brand before; but, I thought this mask looked so fun! They have a couple different printed masks, including one that has a flower crown, so they will certainly appeal to anyone who loves the fun snapchat or instagram filters! This mask is straightforward to use - wash face, tone skin, unfold mask and apply to face, wear for 15 - 20 minutes, (plus you'll need a selfie in there with this printed mask! ), remove and massage extra essence in to skin. Complete skincare routine. This was a super bright print and it looked so fun - I also thought it had a pretty good fit for a printed mask - it had a couple of tabs to help fit around the edges and was only a little big around the chin. This came with a good amount of essence; but, I found it absorbed really quickly and this mask was done after about 15 minutes. My skin felt okay after wearing this; but, I did find that it felt dry about 15 minutes after removing this - so, if their were any nourishing or hydrating properties, unfortunately they were gone very quickly! Bummer, while I love fun printed mask, I do expect them to deliver more results as well. Are you guys as drawn in by fun packaging too?! Ooh I didn't know that Chapters has face masks! I'll have to go scope out their stash, lol! Love the print on this one, but it's too bad that it didn't offer much hydration. I was so surprised, so of course I had to pick one up! And, I would totally go back and try another one! Oh great, another place I now need to shop at for sheet masks! Super cute design though! Can't wait to see what you think about them!